Please note that the content of this book primarily consists of articles available from Wikipedia or other free sources online. 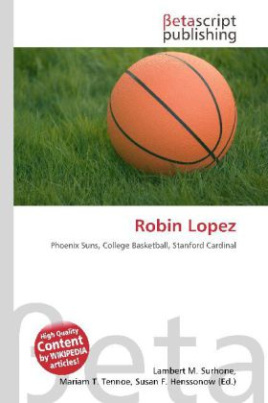 Robin Lopez was born in North Hollywood, California to Heriberto Lopez and Deborah Ledford. He was born into a life of basketball, as his grandfather played at the University of Colorado. His aunt was an architect residing in the Bay Area. Lopez moved from Hollywood, California to Oak Harbor, Washington while in second grade to be near his older brother, Alex, who was playing basketball at the University of Washington at the time. He moved to his current hometown of Fresno, California a year later, where he attended San Joaquin Memorial High School. There, he played with his twin brother Brook Lopez, as well as current Washington standout Quincy Pondexter. Both teammates played with Lopez on their successful AAU team, the Elite Basketball Organization (EBO), along with Derrick Jasper of the University of Nevada, Las Vegas and Trevo''nn Willis of the University of Nevada, Las Vegas. Lopez was named MVP of the Adidas Superstar Camp Underclass All-Star game his junior year and to both the 2006 McDonald''s All American team and the Parade All-American team his senior year.